In March 2017, Samsung acquired Harman International for $8 billion.It was a hefty sum, but the move was a way for Samsung to instantly gain greater access into the automotive sector, where Harman was an established leader in electronics. With the rise of connected cars and the imminent arrival of self-driving cars, technology is largely the driving force behind automotives, and as one of the world’s largest tech companies Samsung couldn’t afford to not play a role in the space. Less than a year later, the industry is seeing some of the first products emerge from the partnership partnership. At this years’s CES, Samsung and Harman unveiled three new products for connected and driverless cars: a digital cockpit platform, a 5G automotive telematics solution and an autonomous driving platform known as DRVLINE. Leveraging the power of Harman’s Ignite platform, the new cockpit solution from Harman and Samsung empowers drivers with an interface perfectly suited for the next generation of automotives. All three levels of configuration — low, medium and high — offer cloud services to lower costs for the infotainment system, and even vehicle weight. The premium configuration of the Digital Cockpit stands apart from similar products on the market today. Services such as virtual personal assistants and augmented reality can be integrated across as many as four displays. Plus, vehicle preference profiles can be taken from one vehicle to the next. That means that even though the ride-hailing and ride-sharing services may expand, a passenger utilizing the Digital Cockpit platform can still make every vehicle he enters feel like his own. The connected car, as game-changing as it has already been, is far from a complete product. Many believed that the technology won’t be fully maximized until 5G mobile connectivity is widespread. 5G networks promise incredibly fast connection speeds. Some experts believe they may even replace WiFi. But because industry standards for 5G are yet to be determined, companies have found it hard to prepare for this future. 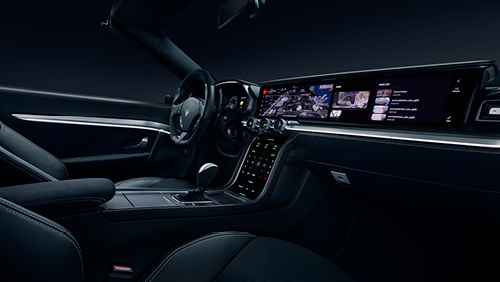 With its 5G automotive telematics solution, Samsung and Harman, however, have developed a product that can work with the LTE CAT 16 connectivity of today and be instantly ready for the 5G networks of tomorrow. With up to 1GB per second bandwidth, this telematics solution has the potential speed to enable the vehicle-to-vehicle (V2V) and vehicle-to-infrastructure (V2I) capabilities that will empower self-driving cars. In designing its autonomous platform DRVLINE, Samsung and Harman wanted to create a future-proofed product. Everyone wants to build an autonomous driving platform because the potential business from creating the one that becomes ubiquitous across all driverless cars is enormous. The problem is that no one is sure exactly what the technology of tomorrow will look like. With DRVLINE, Samsung and Harman claim to have developed software that is so versatile and customizable that it will be able to serve the AV sector as technology progresses towards Level 5 autonomy.